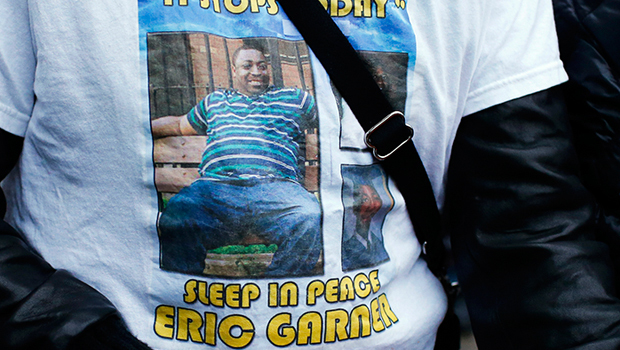 Why no criminal charges in Eric Garner's death? NEW YORK -- The cell phone video of the last moments of Eric Garner's life was watched millions of times on the Internet, clearly showing a white police officer holding the unarmed black man in a chokehold, even as he repeatedly gasped, "I can't breathe." But despite that visual evidence, and a medical examiner's ruling that the chokehold contributed to the death, a Staten Island grand jury decided Wednesday not to bring any charges against the officer involved, sending thousands of protesters onto New York's streets, where they marched, chanted and blocked traffic into the next morning. While legal experts note it's impossible to know how the grand jurors reached their conclusion, they say the Garner case, like Michael Brown's death in Ferguson, Missouri, once again raised concerns about the influence local prosecutors have over the process of charging the police officers they work with on a daily basis. "The video speaks for itself," said Jeffrey Fagan, a professor at Columbia Law School. "It appears to show negligence. But if we learned anything from the Brown case, it's the power of prosecutors to construct and manage a narrative in a way that can shape the outcome." Ekow N. Yankah, a professor at Cardozo School of Law, agreed that, "It is hard to understand how a jury doesn't see any probable cause that a crime has been committed or is being committed when looking at that video, especially." Another observer, James A. Cohen, who teaches at Fordham University Law School, went further, saying, "Logic doesn't play a role in this process." U.S. Attorney Eric Holder said federal prosecutors would conduct their own investigation of Garner's July 17 death as officers were attempting to arrest him for selling untaxed cigarettes on the street. The New York Police Department also is doing an internal probe which could lead to administrative charges against Officer Daniel Pantaleo, who remains on desk duty. The grand jury's decision prompted emotional protests around New York and in cities from Atlanta to California. But CBS News legal analyst Eboni Williams said that, while "there is such a preponderance of evidence... the way they (jurors) apply that evidence to the law makes it more confusing than it looks to be on the surface." Williams said the chokehold itself was "against New York Police Department policy, but not illegal per se, and that's something that a lot of people have a hard time wrapping their minds around." "Also, the medical examiner ruled it a homicide... this is a wrongful death" said Williams, "but this all goes back to the wide latitude that officers -- particularly -- enjoy when it comes to the use of force in these cases... officers' jobs are inherently very dangerous, so the law does afford them this wide latitude and space to make decisions about what's necessary." Williams pointed out that the 23 men and women of the grand jury sat for two months and based on the evidence they had, decided Pantaleo's actions were "permissible under the law." "The other side of that, though, is was it the most reasonable act," said Williams. "Many people look at this and say, 'well, there are so many things different that this officer could have done,' and that may well indeed be true, but under the letter of the law, it looks like these 23 people found it to be permissible." Analysis: What's the difference between Eric Garner and Michael Brown cases? Williams noted that while in the Ferguson case of Michael Brown the victim's family is expected to file a civil suit against the entire department over its policy and practices, Garner's family is more likely to target Pantaleo individually as they continue their legal battle. "The officer in this case (Pantaleo), he did not adhere to the policy and to his training, so we will probably not see the New York City Police department a part of that lawsuit, and if we do it will be a much more challenging burden to hold the department accountable, because the department has already looked at this issue... and they said, 'we don't allow that.' So this officer was, if you will, acting rogue." "This fight ain't over, it just begun," said Garner's widow Esaw after the grand jury's decision was announced Wednesday. In Manhattan, demonstrators laid down Wednesday night in Grand Central Terminal, walked through traffic on the West Side Highway and blocked the Brooklyn Bridge. A City Council member cried. Hundreds converged on the heavily secured area around the annual Rockefeller Center Christmas tree lighting with a combination of professional-looking signs and hand-scrawled placards reading, "Black lives matter" and "Fellow white people, wake up." And in the Staten Island neighborhood where Garner died, people reacted with angry disbelief and chanted, "I can't breathe!" and "Hands up - don't choke!" But the demonstrations were largely peaceful, in contrast to the widespread arson and looting that accompanied the decision nine days earlier not to indict the officer in Brown's death. Staten Island District Attorney Daniel Donovan said the grand jury found "no reasonable cause" to bring charges, but unlike the chief prosecutor in the Ferguson case, he gave no details on the grand jury testimony. The district attorney said he will seek to have information on the investigation released. In order to find Pantaleo criminally negligent, the grand jury would have had to determine he knew there was a "substantial risk" that Garner would have died. Pataleo's lawyer and union officials argued that the grand jury got it right, saying he used an authorized takedown move - not a banned chokehold - and that Garner's poor health was the main cause of his death. "State grand juries tend to be too compromised with local politics because local prosecutors run for office and they have to depend on the police for evidence," he said. "Don't we have the right to question grand juries when we're looking at a video and seeing things that don't make sense?" The video shot by an onlooker showed the 43-year-old Garner telling a group of police officers to leave him alone as they tried to arrest him. Pantaleo responded by wrapping his arm around Garner's neck in what appeared to be a chokehold. The heavyset father of six, who had asthma, was heard repeatedly gasping, "I can't breathe!" He later died at a hospital. The medical examiner ruled Garner's death a homicide and found that a chokehold contributed to it. A forensic pathologist hired by Garner's family agreed with those findings, saying there was hemorrhaging on Garner's neck indicative of neck compressions. Columbia's Fagan said another factor was that the Staten Island grand jury came from the most conservative and least racially diverse of the city's five boroughs, and home to many current and retired police officers and their families. "Staten Island is a very different borough," he said. "In fact, it may be closer to suburban St. Louis, and we can't discount that."